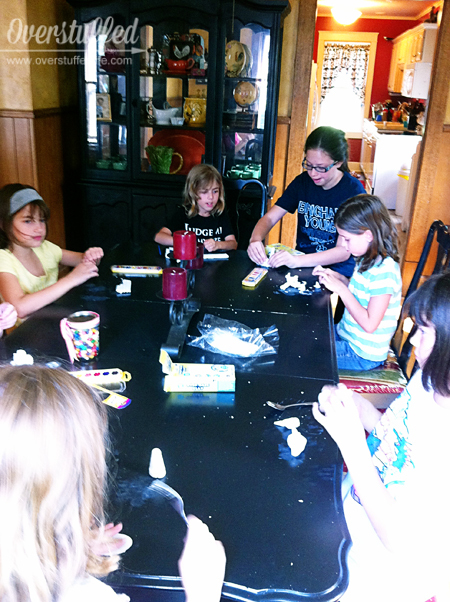 My girls did their first summer book club in the summer of 2012. Sophia was still a bit young for such an activity (though she did participate a little), and Bria and Chloe hosted a combined book club with several of their friends. The book they chose was From the Mixed-up Files of Mrs. Basil E. Frankweiler by E.L. Konigsburg. Bria had read it before and really enjoyed it, and it was a good choice for both age groups. 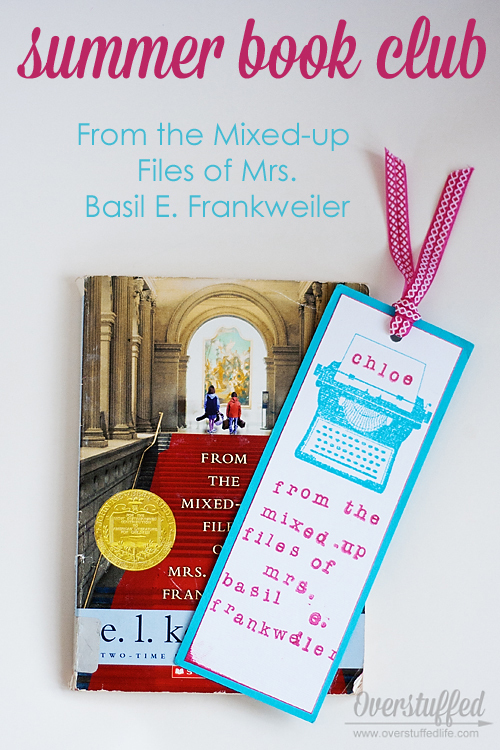 I recently found Chloe's bookmark from that book club, and realized I had never blogged about it. We held the book club just a week or so after returning from The Epic Vacation, and I've never even finished blogging about that whole trip, though two years later I'm still trying! So, even though I only have one photo of the actual event, I'm blogging about it now. The bookmark you see in the above photo was our invitation. We used stamps, ink, and cardstock from my stash to make them, and I love how they turned out! Aside from the book title being so darn long, they were pretty easy to make, and the girls helped me out a lot. On the back of each bookmark we wrote out the date and time information for the book club. Since this was our first book club ever, we had already passed the date and book by the other parents via email, so the invitation was just a formality—and a good reason to make a cute bookmark! We planned a fun Jeopardy game for the discussion portion of the book club. We just used a big whiteboard we have to write the categories and dollar amounts, and I had the questions written in my notebook. And that is the only photo I took of the entire activity. I had watercolors out in case anyone wanted to paint their angels, but everyone opted to keep them white like the angel in the book. While our angels were baking in the oven, we cleaned up the table and ate ice cream sundaes. We had ice cream sundaes because Claudia carefully saved her allowance each week to be able to buy one for herself in the book. And that was pretty much it! Of course there was much playing and having fun together that had nothing to do with reading, but reading is an awesome excuse to have a party, if you ask me! We have two book clubs coming up in the next couple weeks—one for Sophia and one for Chloe. This time, I promise to blog about them right away! Follow my "Reading Rocks" board on Pinterest! Great idea to help kids learn to love to read. The bookmark is adorable! Sounds like a fun time. I loved getting books from the library in the summer and getting lost in them when I was a kid. Sounds so much fun. I remember loving to spend my summers reading outside or inside. Library day is the favorite day around here!